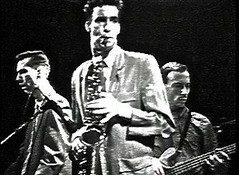 We finally shot the Lounge Lizards at CBGBs in the spring of 1979, just a few months before we bought our first color camera. Good thing, too. They just looked better in black and white.